Diabetes is a common condition amongst seniors, caused by a lack of insulin in the body and resulting in high blood sugar levels. According to the CDC, over 29.1 million people, 9.3 percent of the population, have diabetes. Most Harrisburg senior care experts would argue a healthy diet can stave off many health complications, and there are some great foods your loved one can eat to help prevent diabetes or manage an existing condition. In addition to being heart-healthy, nuts also contain diabetes-preventing properties. Nuts can help lower cholesterol, and studies have shown seniors with healthy cholesterol levels are less likely to develop diabetes. Also, choosing healthier sources of good fat like nuts rather than red meat may help prevent obesity, another huge risk factor for diabetes. A study in 2008 from Diabetes Care revealed seniors who eat more leafy green vegetables such as spinach, kale, and collards are less likely to develop type 2 Diabetes. Green vegetables are low in carbohydrates, which helps keep blood sugar levels down. Some studies suggest the high magnesium content in leafy greens is what makes them helpful in preventing diabetes. These vegetables are also high in polyphenols and vitamin C, which can help further reduce diabetes risk. Vegetables that don’t turn to starch during the digestion process such as onions, garlic, eggplant, and yellow and red peppers, have an almost nonexistent effect on blood glucose. They are also high in fiber and phytochemicals, which can help reduce inflammation and prevent weight gain. Cinnamon contains antioxidants that can prevent or alleviate inflammation associated with diabetes. Some studies have shown seniors who regularly eat foods with cinnamon or take cinnamon supplements tend to have a lower glucose level than those who do not regularly include cinnamon in their diet. 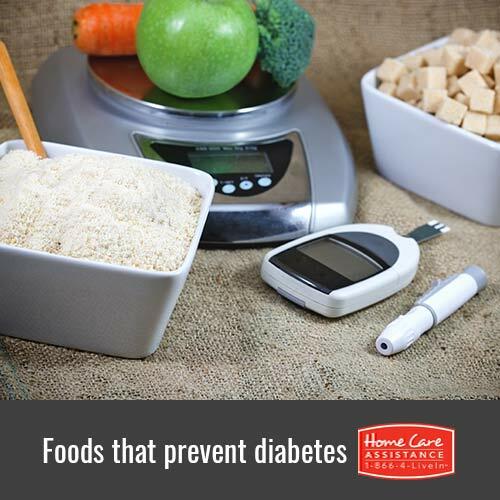 Seniors with a low glucose level are far less likely to develop insulin resistance or diabetes in the future. Beans and other legumes are an excellent source of healthy carbohydrates. One study by the Archives of Internal Medicine indicated seniors who consumed at least a cup of legumes per day had a more controlled blood sugar level than those who chose mostly whole wheat. Because beans and legumes are low on the glycemic index, they can manage blood sugar levels better than other starchy foods and further reduce the risk of diabetes. There are many ways to promote your loved one’s health, but a healthy diet is often one of the easiest places to start. If he or she needs help with grocery shopping or preparing nutritious meals that can help prevent or manage existing diabetes, reach out to Home Care Assistance. We provide hourly and live-in care Harrisburg families trust, and our caregivers will always look out for your loved one’s needs. For more information on our senior care services, call one of our Care Managers at (717) 540-4663 to schedule a free in-home consultation.